Reissue Review: Cheap Trick, "The Classic Albums 1977-1979"
Record Store Day isn’t just in the spring anymore. The annual tradition now happens twice a year, once in the spring, and once on Black Friday. Since you’re already out spending enormous amounts of money on enormous electronic devices, seek out your local independent record store and buy some gifts for the music geek, or, let’s be honest, buy it for yourself. Because a box set is the greatest gift in the world. The record labels have put together some impressive, huge, and gift-worthy sets specifically for “Back to Black Friday” (November 29th) this year, including this lovely, limited edition, individually numbered box set featuring Cheap Trick’s first five albums remastered and pressed onto that ultra-thick, luxuriant 180-gram vinyl. (Thank you, Legacy Recordings.) Cheap Trick’s tight pop-meets monstrous rock finally sounds as important as it ought to be in the greater rock pantheon. Cheap Trick’s first five albums, in original packaging, are accounted for: the self-titled, In Color, Heaven Tonight, Dream Police, and, of course, the classic live album At Budokan. Consider for a moment that this band recorded all five of these albums, their best albums, in just a three year period. Nowadays, bands don’t release albums in consecutive years, let alone outstanding ones. I have highly romanticized Cheap Trick. It’s perfect that they recorded the That ’70s Show theme song, because that sitcom is the physical embodiment of the feelings Cheap Trick gives me. A midwestern paneled basement, friends, a secret beer or five, listening to LPs until you have them memorized. 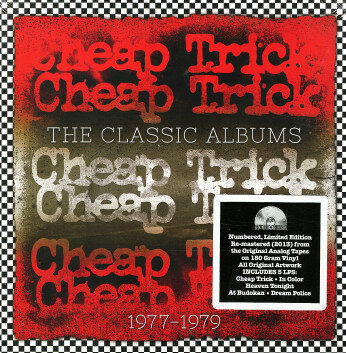 Cheap Trick would have been in rotation for me, alongside its more lauded hard pop contemporaries Kiss and Van Halen. This box set, however, recreates those experiences I am just a little to young to have had firsthand. But the recordings here are just as good, if not better, than the originals, and plus now I can play them on a much better turntable than the one that would have been in use in my parents’ basement. But rock songs about chicks, and rock itself, never go out of style. Nor does that awesome logo. So go buy this box, while you can.